Out “Reach”…reaching out beyond our community! In 2009, John Robb, CPO, attended a trip to Haiti to assist Healing Hands Team Canada in providing orthotics & prosthetics to several orphanages and the citizens of Port Au Prince. Due the horrific earthquake that took place in early 2010, the Healing Hands for Haiti compound is now demolished. John is anxiously awaiting for Healing Hands to attain temporary facilities so that he may return to Haiti to assist in providing more orthotic & prosthetic care. Physicians for Peace educates and trains prosthetic, orthotic, and rehabilitation professionals in underserved areas. They partner with healthcare providers to improve their prosthetic and orthotic (P&O) rehabilitation centers. Reach takes all donations of orthotic & prosthetic devices and gives them to Physicians for Peace. 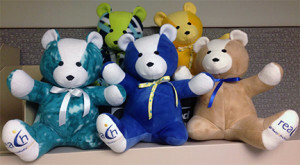 Reach purchases custom made bears from Scattered Stiches, with all proceeds going to the Wounded Warrior Project. Norfolk, Virginia Beach, Williamsburg, Gloucester and entire Hampton Roads area.